Plastics industry 4.0 | What does 4.0 mean for the plastics industry? The fourth industrial revolution is constantly on the minds of industry leaders in Germany, Europe and the rest of the world under the buzzword "Industry 4.0". In this subject area – also termed "Internet of Things" – the integration of industrial production with state-of-the-art information and communication technologies is being researched and developed. Its objective is to enable full communication between man, machine and product. The key factors are horizontal integration to interlink not only different process steps, but also different companies along the entire value chain, and vertical integration to connect individual part-systems of the production cells to form a single, holistically controllable production system. What does 4.0 mean for the plastics industry? Applied to plastics processing processes, the fourth industrial revolution means the integration of supplier and customers but also the much closer interlinking of internal departments and processes. Industry 4.0 offers the opportunity to manufacture "batch size 1" at the same cost as mass production. Major opportunities for plastics processing lie in the production of individualised, customised parts and the shortening of development, start-up and set-up times. This will enable even small batch sizes to be produced economically. New approaches for the enhancement of production efficiency and cutting edge developments in digitised production will be reflected in the talks given by the invited top-level experts during the IIMC 2017. Horizontal integration allows the economical manufacture of individual, customised parts. For this, all elements involved in the value chain are designed for maximum adaptability and versatility, and interlinked on the information side. The research project "Composite Repair 4.0: Interactive repair for electric vehicles in CFRP construction", sets out to enable, for example, the production of individual, damage-adjusted repair patches for FRP structural parts. At K 2016, IKV will demonstrate in cooperation with a strong industry consortium, the production of injection-moulded parts in a number of different variants according to the particular requirements. Use is made of networked information systems that allow visitors to the trade show to initiate customised production orders themselves at different locations and to track their progress. The forwarding and use of all relevant information in the sense of vertical integration enables autonomous optimisation of existing production processes. In the Cluster of Excellence "Integrative production technology for high-wage countries", core aspects of Industry 4.0 have been tackled at RWTH Aachen University over the last 10 years. Mit dem Ziel eine inline qualitätsgesicherte und regelbare Fertigung von Luftfahrtbauteilen im RTM-Prozess zu ermöglichen, wurde gemeinsam mit den Firmen Airbus Operations GmbH, Stade, und Fill Gesellschaft m.b.H., Gurten, Österreich eine neuartige Injektionsanlage entwickelt. Basierend auf Einwegkartuschen ermöglicht die neuartige Injektionseinheit die Fertigung von RTM-Bauteilen unter kontrollierten Bedingungen. Die Injektionseinheit ist mit einer Sensorbox ausgestattet in der neben Temperatur- und Drucksensoren auch ein dielektrischer Sensor verbaut ist. Hierdurch ist unteranderem eine inline Messung des Vernetzungsgrades des Harzes sowie der Viskosität möglich. Während der Vernetzungsgrad für die qualitätsgesicherte Fertigung relevant ist, bietet die Viskositätsmessung das Potential einer integrierten Regelung des Injektionsprozesses. In the Cluster of Excellence "Integrative production technology for high-wage countries" at RWTH Aachen University, a structure for self-optimising production systems has been developed under the title Model-based self-optimisation (MBSO). 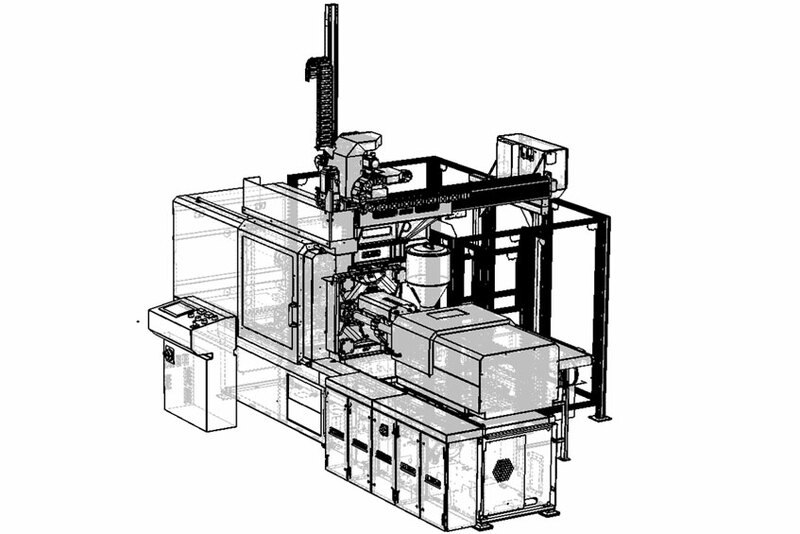 The aim is to attain constant part quality in the injection moulding process despite different disturbance variables and boundary conditions such as fluctuations in material batches, or the amount of wear of the machines and moulds. For this, a process control tailored to the plastic, which utilises the connection between pressure, volume and temperature (pvt behaviour), is combined with a viscosity-regulating operating point optimisation. These quality models are supplied with information from the sensor level and deliver pressure target values adapted to the present operating state in the mould. These target values can be achieved with the help of a model-predicative control (MPC) so that a given pvt curve is reproducible despite any disruptions. Self-optimising strategies in plastics processing improve the stability of the process to external disturbances and thus reduce rejects. This applies in particular to start-up scrap because the process adapts to the present conditions in which the thermal equilibrium has not yet been reached. The Industry 4.0 approach of the project "iComposite 4.0" lies in the intelligent production system, which is realised among other things through a linking-up of the individual components with a regulating production control system. The aim is to develop a flexible and self-regulating production plant for the economical and quality-monitored series production of RTM structural parts with 3D fibre-sprayed preforms and continuous fibre reinforcement oriented to the actual demands. 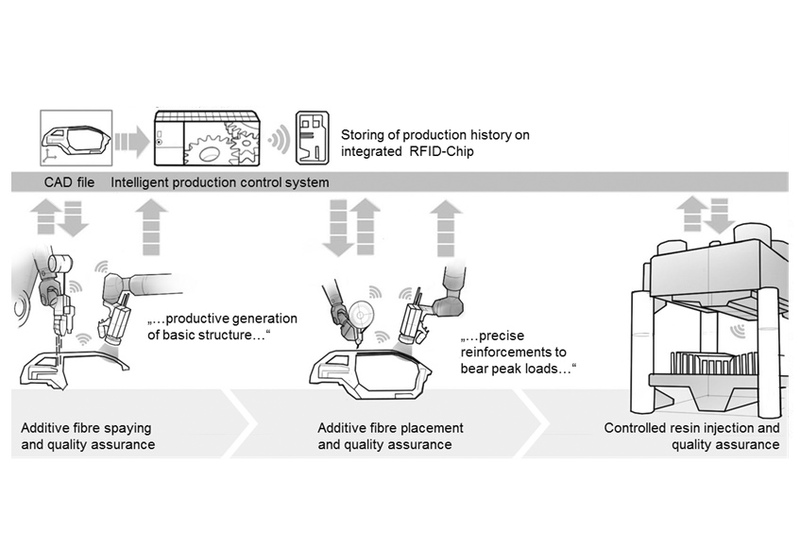 This enables not only a simple control of the process parameters but also a control of the final part properties – the change of paradigm from tolerance-based production to product function-driven production. The importance of the digital shadow of processing processes for the prediction and optimisation of part quality and process flow is constantly increasing. Software tools developed at IKV improve the prediction accuracy of quality forecasts and thus enable optimisation of the entire product life cycle. In extrusion research, as part of the Cluster of Excellence, a simulation environment is being set up that allows the flow simulation and subsequent geometry optimisation in additively manufactured extrusion dies. This means that cost-intensive iteration loops in the design phase can be reduced. In the field of injection moulding, a study is being carried out as to whether the consideration of inhomogeneous part properties for the prediction of shrinkage and warpage can enable optimisation of the design process for injection moulding tools. The study considers, on the one hand, crystallisation processes on the microscale level. 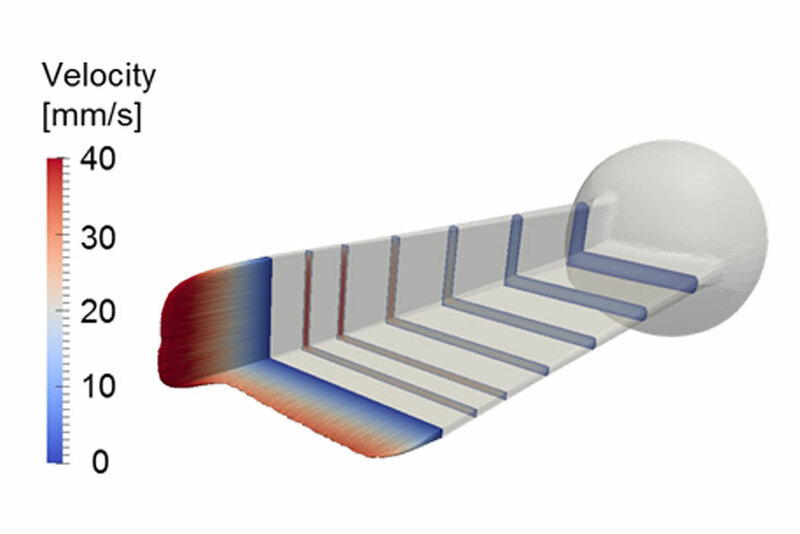 On the other, in an interdisciplinary approach, it improves the attainable tolerances of melt-based manufacturing processes in the collaborative research centre "Precision manufacturing by controlling melt dynamics and solidification in production processes". For this, a measuring process is first developed, which allows space-resolved temperature measurement in the cavity and serves as an input parameter for the used models. In a reverse engineering approach, the actual temperature requirement for a process without warpage is subsequently determined, thus setting new standards with regard to the quality of injection-moulded parts. Common to both plastics and metal as far as their forming processes are concerned is that, first of all, a melt is conveyed into the relevant cavity of the mould, where it solidifies. Temperature equalisation processes between the melt, the forming structures and the mould determine the resultant states of order on a molecular and atomic level, which decisively characterise both the morphology and the creation of internal stresses. With plastic parts, these internal properties often lead to serious problems during the production process, for example to shrinkage and warpage. The basic mechanisms have, however, not yet been thoroughly investigated in research on plastics processing as a whole because of inadequate models and a lack of material data. In this project, temperature equalisation processes are examined and subsequently modelled with the aim of improving the prediction accuracy of the warpage of plastic parts.